Reader “Catherine” emailed the question: “Is this restaurant still recommended?” We don’t recommend restaurants per se, but rather use the Foodie as an excuse to go out for lunch. 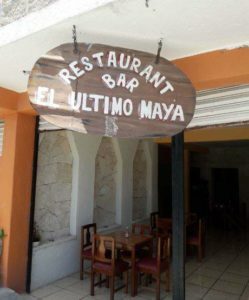 When El Último Maya first opened, their sopa de lima was the very best in town. The restaurant has changed hands several times over the years, and the quality has also changed — several times. Foodies spent a lunch hour there recently because once again the restaurant has changed hands. Elena is in charge and waited on the 12 tables. The menu offers soups, starters, Mexican entrées, seafood, and breakfast that is available all day. The shrimp cocktail is a meal in itself with a pleasant sauce. Hours are 8 am — 10 pm. Hours are 8 am — 10 pm. Happy Hour is 2 beers/$50mx and runs from 7 – 9 pm.